Now, at the end of our first official house sitting experience in Armidale and only five days to get to Victoria with thoughts for the unproven ability of our van towing a heavy trailer, we felt an early start was a good idea even if the first day was only 100 kilometres or so. After making sure the house was spotless, as she is prone to do, Julie put fresh flowers on the table while I finished sweeping out the shed. We were packed and ready to head off by 9.00 and Benny was starting to look worried again. He needn’t have, the original team was due back just after lunch and dinner would be served tonight. Now we were officially house sitting travellers we planned our first stop, also our first ‘free camp’ for a place called Apsley Gorge near Tia Falls on the road to Port Macquarie. The free part is a slight exaggeration in that a small fee was required to stop in the national park but there were toilets and fire pits so it was a fair trade for first timers. During preparations for this new lifestyle, we had purchased a ‘change-room’ tent we could use as a shower room for our portable shower hose with pump. The idea was that we could put out the awning on the side of the van and erect the tent beside the passenger door creating a wind barrier from the front and we could hang a tarp, yet to be purchased, to cover the open two sides. It worked well except for two small issues. One, the pump did not work, so I spent a few uncomfortable minutes slushing myself down in warm water while my personal equipment retreated inside where it was still relatively warm, a storm with little rain but a lot of wind, came through the camp and blew the tent over in the night. Other than that it was a complete success. Ok it was cold out, but when you’re snuggled up in a warm bed, the wind is belting through the trees rocking the van and tomorrow will bring another adventure, one can sleep like a baby. By that I don’t mean I wet my nappy, I meant we slept very well. Like a baby, does, should. You know what I mean. 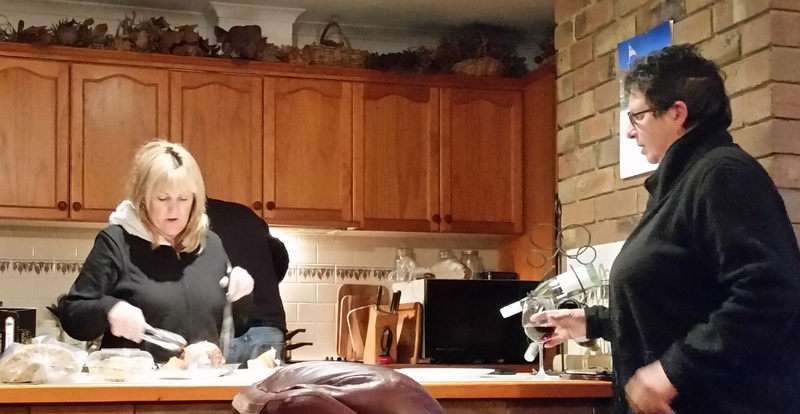 The following day we covered the 150 kilometres to meet up with one of Julie’s old friends she hadn’t seen for 30 years. Robyn travelled in from another town to meet us at a Service Centre restaurant just outside Port Macquarie. After lunch I called a friend who lived in Port Macquarie which is really a small city rather than a town and who had earlier agreed to put us up for the night. John and Caroline are the kind of fun people who one really looks forward to seeing. 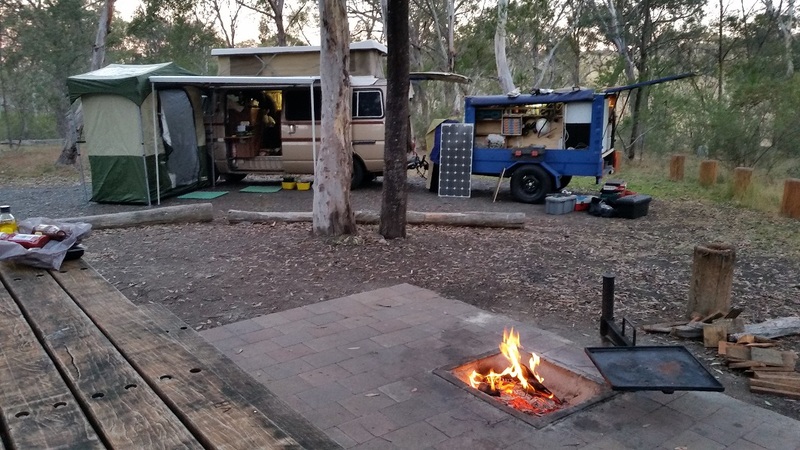 They have travelled extensively around Australia with one of the best caravan/4wd setups you could expect to see. Caroline is funny and excitable and unsurprisingly, John is unusually calm and understanding. 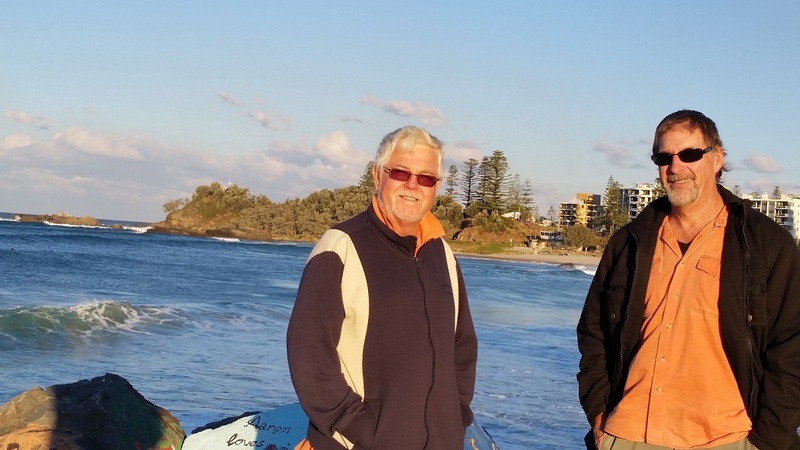 After spending years on the road, they selected Port Macquarie to buy a home, making them one of the few couples who have actively chosen a place to live. Most of us just live where we are born or drift into, but this couple is well organized and great fun to be with. We spent the afternoon walking along the river esplanade up to the beach and back. It was a late night. I don’t think we drank all their wine. By mid-morning the effects of last night had largely worn off, so we cranked up the van and headed for Sydney. 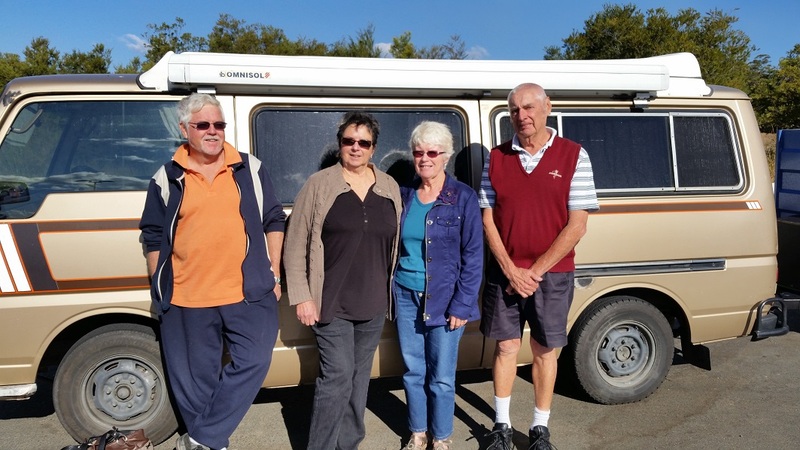 At 400 kilometres it was not an unusually long trip but the van was not pulling well. I changed spark plugs in Bulahdelah and that seemed to work better. Although we got to Sydney in reasonable time, the infamous Sydney traffic delayed us to the extent we did not arrive in Milperra, our destination for the night, until after 7 pm which made for a longish day. We parked up the van with family and proceeded to the Milperra pub, notorious for the Father’s Day Milperra bikie massacre in 1984. Dinner was excellent. So far we had used up two of our five days so we were comfortable diverting to Crookwell to meet the people for whom we would ‘sit’ in another 10 weeks or so. This meant the day was a relatively short hop of 200 kilometres via Goulburn. Fortunately our membership of the house sitting site was doing its job and we had been in contact with a farmer and his wife who were planning a “once-in-a-lifetime” trip, to quote him exactly. 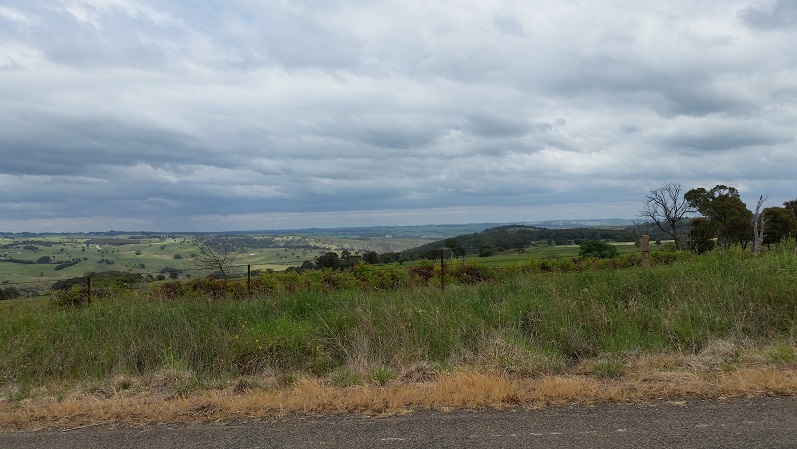 We had no time for sightseeing so it was only a perfunctory introduction to Goulburn before travelling the 40 kilometres north and west up the range to Crookwell. This short distance was striking. Only minutes out of the small rural city and the panorama opens before you, a vast expanse of green fields dotted with sheep, tidy farm houses and on the horizon the mountains or what passes for mountains in our ancient eroded land. The view is only slightly marred by the distant wind turbines but other than that it could be mistaken for any world class countryside view in Europe or the Americas. The road winds easily across the country side, ever upwards but still having surprises with the occasional downhill run, like the breathtaking cresting of a hill and seeing the road below cut across the end of large lake. I really liked this area already. We arrived in Crookwell in the early afternoon and immediately taken with the interesting entrance to town. It was one of those “unspoilt” places, a small town where the houses are close and there are no fences, one could easily imagine a time when it was horses passing by these cottages. The town has mostly old facades but it has a prosperous look about it too. We refuelled here before taking the road out of town towards the farm. The weather was overcast and a little light rain was falling but nothing could spoil our mood this afternoon, still climbing as we continued tracking north and west along the 15 kilometres of bitumen, giving way to dirt halfway. We’d been talking by phone of course and Ian gave such generous, all encompassing and wide ranging directions, they included the road we should not take. With the name of that road now top of mind, naturally I recognized it the moment it came into view. The bit I missed was the ‘NOT’ part. Almost immediately we were careening along a decidedly narrow and slippery dirt road that was beginning to look like it was an alternate way to the bottom of the mountain. A few moments later, we were on top of a long hill, straight fortunately and as we ‘went over the top’ our head-strong took this as an invitation to race us to the bottom. To apply the brakes was to invite disaster. Safely arriving at the bottom, it became apparent the property numbers were decreasing, so clearly we were headed in the wrong direction and even more obviously, on the wrong road. As the rain continued to fall, we discussed the possibility of locating a suitable property entry that we could use for the exciting task of turning our under-powered under-equipped rig in the opposite direction. Suffice to say, the about turn was accomplished without disaster and now ‘all’ we had to do was climb our mighty ship to the top of the hill that was taunting us from a short distance away. With gritted teeth and a murmured ‘at least we’re cashing in our chips together’ the tired little engine roared to full revs and we took the long run to hit the base of the hill with the utmost momentum we could muster. A few anxious bum-clenching minutes later we had slipped, slid, skidded and spun our wheels to the top and back onto the main road where we were met by our by now mystified host in his 4WD, who was no doubt thinking ‘where the hell you been?’ but who stoically led us to our sanctuary for the night. As we made introductions, I was immediately struck by how well Ian’s appearance matched the voice and easy manner so noticeably on the phone. 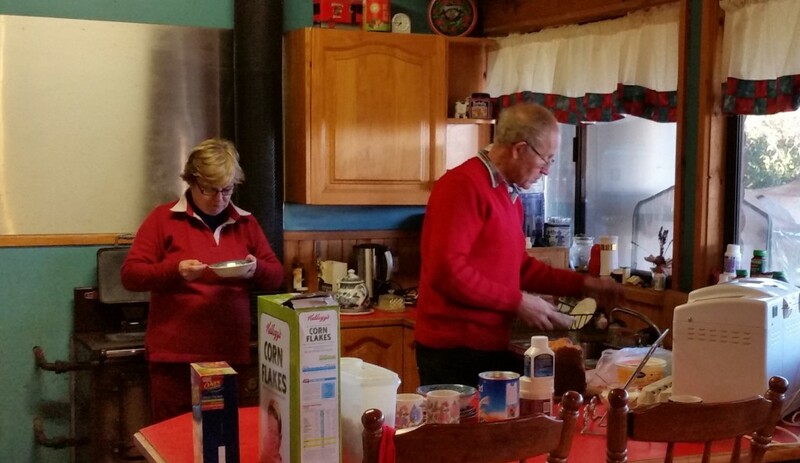 Ian’s wife Jo was waiting inside the warm genuine country kitchen, with the wood stove and the smell of fresh bread stirring up childhood memories. We were so pleased to meet such wonderful people, so welcoming and interesting. Ian and I spent the rest of the day touring the property so I’d have a fair idea of what needed to be maintained during the 2 months they would be touring Europe. By the time we left the next day, we felt like it was saying goodbye to friends, which by then they were. 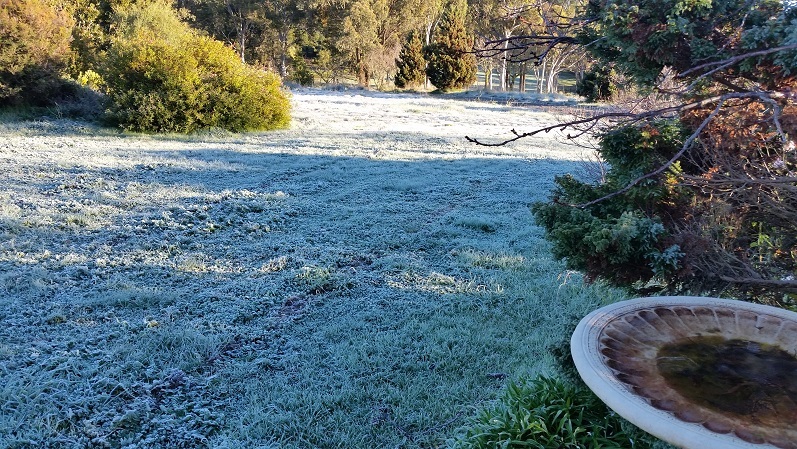 As parting reminder of things to come, the weather put on a crystal clear morning with a heavy frost. We heard that it snowed a couple of days later. We got away early in our mud covered rocket because we had another 450 kilometres to travel to meet our hosts in Glenrowan the village made famous by Australia’s best know bush ranger, Ned Kelly. Driving the Sydney – Melbourne freeway is a no-brainer so by late afternoon we had found our new temporary home for the next 5 weeks. Wendy and Peter introduced us to our new, small white fluffy best friends who certainly made a lot of noise, which hopefully meant they were glad to meet us. It turned out that Peter and Wendy were not due to fly out until the day after so we had dinner with them for two nights. It was great hospitality with Peter cooking the first night. Wendy still had matters to tidy up at work (as a school principal) and Peter had last minute things to do also so we did not see them the next day but we had another enjoyable dinner that night. Very early the next morning they were on their way to the airport before we even got up. Glenrowan is not unusual in elevation, only 230 metres but its southerly latitude makes it cold enough in winter. The mornings were consistently well below freezing but as the house faced east overlooking acres of very beautiful garden and rural aspect, it warmed up quickly with the sun streaming in through the large kitchen and dining room windows. In the distance the snow on the mountains became more pronounced as the sun rose higher and by lunchtime, there was mostly an amazing contrast between blue sky and brilliant white snow. This promised to be a most enjoyable assignment. You can forward this article by clicking on the little envelope.